Commercial Karndean floor cleaning Bristol and Amtico flooring cleaning specialists Bristol. Is your commercial karndean floor Bristol or amtico floor looking dirty and you cant seem to get it back to how it should look then you need to contact CleanAndSealUK for commercial karndean floor cleaning Bristol. Cleaning commercial Karndean flooring and amtico floor cleaning is a simple job if done by profesionals,but sometimes stains wont come out of your karndean flooring or amtico flooring in Bristol, Bath and the Southwest. We can either advise you on the best practice for cleaning your commercial amtico and karndean floors Bristol or we can do the work for you. Commercial Karndean Floor care and Amtico floor care Bristol. Amtico and Karndean floor care is necessary If you want your Amtico and Karndean floors .to keep looking good for years to come. You need to Know what products and the correct procedures for your commercial Karndean floor and Amtico commercial floor care otherwise you could permanently damage your Amtico or Karndean floor. Commercial Amtico floor maintenance and commercial Karndean floor maintenance Bristol and Bath. Are you looking to restore your commercial Amtico or Karndean flooring? If so then read on. You might think its time to have your Amtico sealer stripped off and resealed. Or you are looking for a commercial Karndean floor sealer and would like to know more. We have stripped hundreds of commercial Amtico flooring across the UK and resealed them for our customers. Applying top quality sealers to leave any Amtico or Karndean floor looking stunning. Why not consider CleanAndSealUK for all your commercial Amtico floor maintenance Bristol and commercial Karndean floor maintenance. Just fill out our quick and easy form or call us on freephone 0800 6122 462 to get a FAST quote from us.s. Contact Clean and Seal for all your commercial building cleaning services. Ian & Rich from Clean and Seal came and did a fantastic job, they were incredibly efficient from providing a quote, right through to completing the job, even getting finished ahead of schedule. They were very punctual, tidy and organized and I had no concerns with leaving them in my home when I went out. The floor looks brilliant. I would have no hesitation in recommending them to anyone.. I was naturally apprehensive about having my floorboards restored. However I needn’t have worried. Clean and Seal did a fantastic job start to finish. They worked so hard with great attention to detail throughout. They arrived on time and the house was left clean and tidy after each day. My lounge and hallway have been transformed and I am very happy with the result. We are absolutely delighted with our polished concrete floor, we cant thank you enough. Clean and Seal South West are super reliable, honest, hard working and clearly take pride in a job well done. The best in the South West without question! Thank you for transforming our travertine floors. They look great and we appreciated the positive, friendly attitude of you and your team and your overall attitude to customer service. Evening, it’s Jo…. Todd don’t like it…. he absolutely LOVES IT!!!.... just hope it looks the same tomorrow!! Ha Ha… smiles all round (didn’t know my husband had so many teeth!) Thank you so much again! Made my husband an extremely happy man! Work hard, Play hard. See you soon. Bobby Gould, Portishead – Wimbledon FA Cup winning manager 1988. Thanks for getting our driveway clean and at such short notice. Not every one will work on a Sunday. Cheers. Well impressed with the whole job from start to finish, total professionalism throughout. Like the new van to, keep up the good work, ps: my decking and patio look like new. 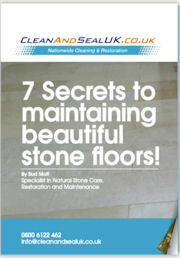 The Secrets To Maintaining Beautiful Stone Floors.